This year’s primary elections in statewide races, state legislative races, and some local races are scheduled for Thursday, September 13. (While primary elections are normally held on Tuesdays, the election date was moved this year to avoid holding elections on September 11 and to avoid a scheduling conflict with Rosh Hashanah, a Jewish High Holy Day.) 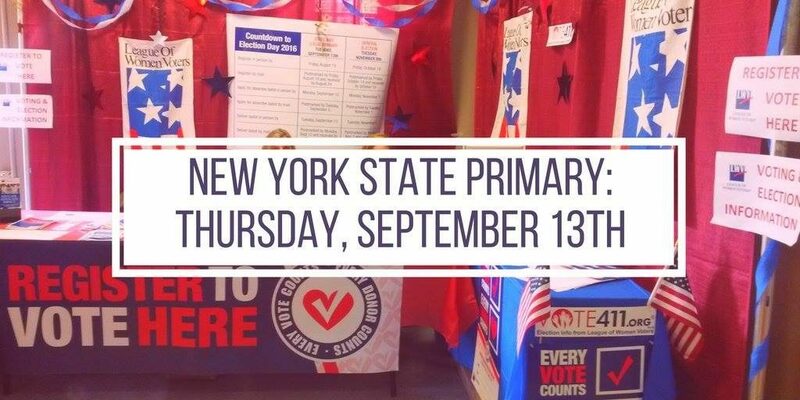 At that time, primaries will be held for the offices of Governor, Lieutenant Governor, Attorney General, Comptroller, Member of the State Senate, and Member of the State Assembly, together with various judgeships and county and local offices. Congressional primaries were held in June. On the statewide level, the Democratic Party is holding primaries for Governor, Lieutenant Governor, and Attorney General. Actress and activist Cynthia Nixon is challenging Gov. Andrew Cuomo in his bid for a third term, and Lt. Gov. Kathy Hochul faces a primary challenge from New York City Councilmember Jumaane Williams. In the race for Attorney General, there are four Democratic candidates: Leecia Eve, a former Cuomo administration official and high-level aide to Sen. Hillary Clinton; New York City Public Advocate Letitia “Tish” James; U.S. Rep. Sean Patrick Maloney, who represents New York’s 18th congressional district; and law professor Zephyr Teachout. Other notable primaries are being held in Assembly District 122 (where incumbent Asm. Clifford Crouch faces a Republican primary challenge from Nick Libous) and in Assembly District 133 (where incumbent Asm. Joe Errigo faces Caledonia Village Trustee Marjorie Byrnes on the Republican, Conservative, Independence, and Reform Party lines). Our organization has created a voter guide for the 122nd Assembly race. Primary elections are an important part of the political process. In primary elections, members of each political party have the opportunity to choose the candidate that they believe will best represent their beliefs and interests. If you are a member of a political party, please check with your county Board of Elections to find out if that party is holding a primary election in your area on September 13. If it is, please make it a priority to find out about the respective candidates in that race and to cast your vote on primary day.